This Sunday (Palm Sunday) we will be passing out 2 (or more) olive wood crosses to everyone who attends worship. The idea is to keep one for yourself and to give the other to a friend, coworker, neighbor, or even a stranger. 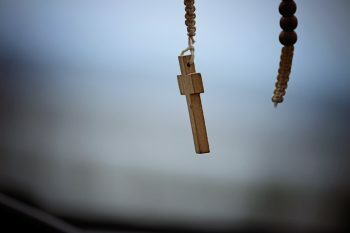 Of course, giving someone an olive wood cross also gives you a wonderful opportunity to tell that person about the meaning of the cross and invite him/her to join you in Easter worship at Trinity! Carved from Olive Trees grown in Israel around Bethlehem. In a shop on Manger Square beside the Church of the Nativity built over the historical site where Jesus Christ was born. By two native Christians that have been doing so for nearly 30 years. Over 1.8 million crosses now in circulation. Distributed through a ministry in Connecticut run by Laird and Ann Mortimer for the past 30 years. They have visited the shop in Bethlehem many times and are good friends with the owners and carvers. You can order your own supply if you want. Pick up one of the postcards in the entryway at church for instructions on how to do so. They are not expensive in dollars (100 for $40 delivered) but priceless in their meaning and effect on the giver and the recipient.